We are visiting Storholmen to read rings of the barnacle geese ahich stay on the island. 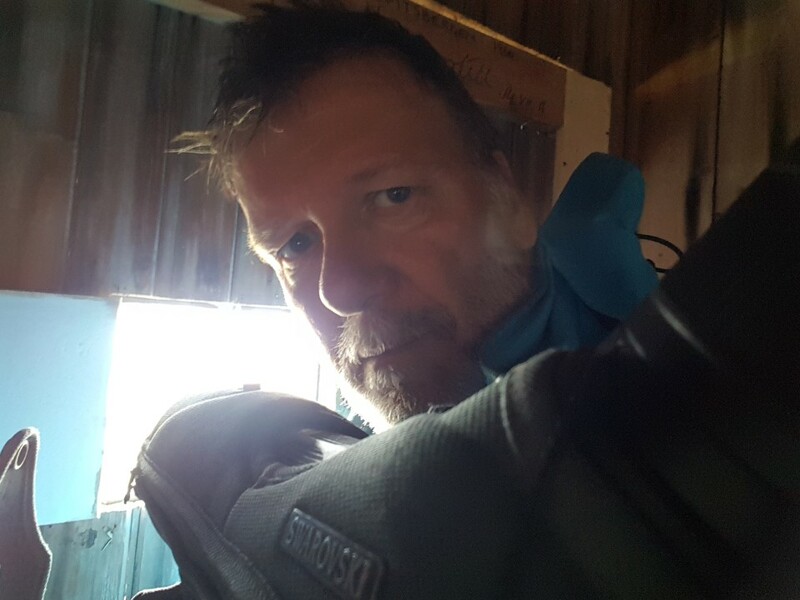 I am reading from the hut on Storholmen. Recently, this hut has been renovated nicely, but inside the hut is now a mess of broken glass. 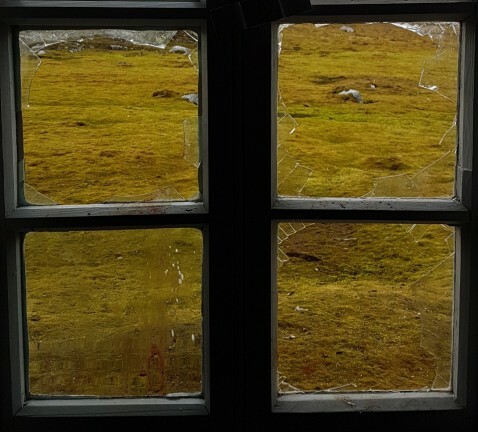 Eight small windows are broken and when we leave the hut at the end of observation we find blood stains on the outside. It must have been a polar bear, which wounded himself. A similar case has been reported two days ago from the Brandalhytta. 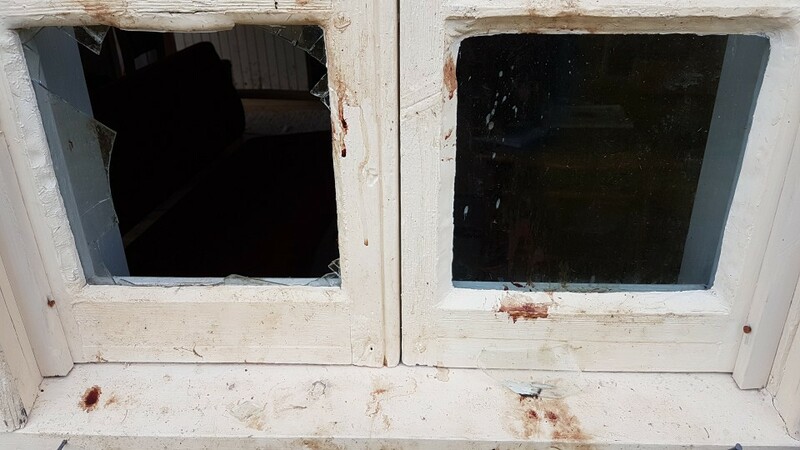 Normally, wooden plates are left against the outside of the windows to prevent this. but those wooden bords where destroyed already earlier and had only a weak attachment. It is really a pity for this nice hut but also for the wounded polar bear. Nobody has seen the polar bear in the last week, the period in which both break-ins seem to have happened.was een stiekeme bezoeker. The pictures above show the window to the southeast, inside and outside. The pictures here are from the window to the southwest, next to the entrance. 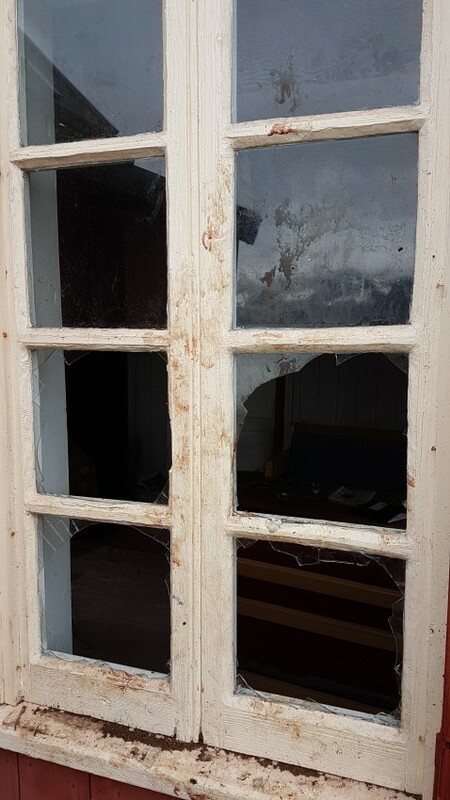 This window still had a wooden protection and is now protected. The other windows are still without protection. A selfie from me observing the geese on the beach through the small window in the door. I was able to check 90 birds and read 20 rings. The youngest family had a ringed male green TFP and three 7 days old goslings. I sudenly saw some wings flapping on the tundra. A glaucous gull had taken one gosling in its beak and the male goose jumped twice on the gull before it could take-off with the golsing still struggling in its bill. It is a cruel dangerous world. A few minutes later I saw the family again on the gravel beach. Now with two goslings as nothing had happened. 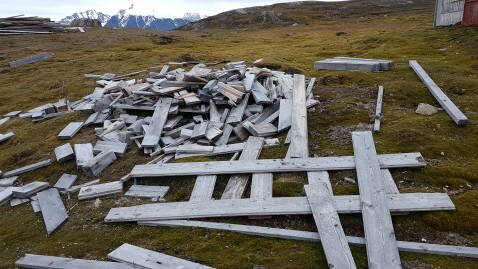 The wood pile has probably been disturbed by a polar bear a bit earlier. This is a video about such a polar bear visit. 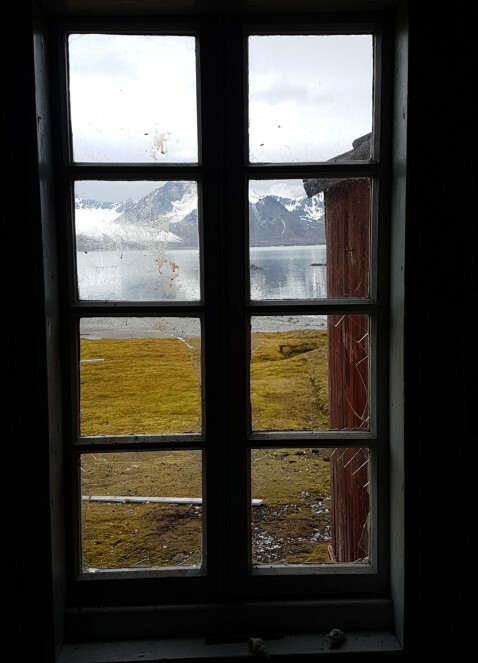 On the way back, we also discover that the tern colony which had formed after the bear visits became less frequent because all eider duck and barnacle geese nests were predated, had disappeared. More than 60 nests of arctic terns. Also predated, either by polar bear or glaucous gull. I do understand the polar bear with the sea ice more than several hundred kilometers nort of its normal position. This page has been given the following keywords: [polar bear] You can click on each keyword to get an overview about related pages.